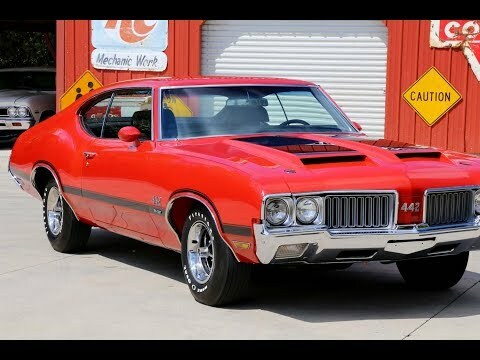 Up for sale we have a 1970 Oldsmobile 442 W30. This legendary muscle car is the real deal, it's a true W30 car that's documented with a build sheet. It comes with plenty of documentation, scoring cards, and receipts from when the restoration was done. Finding a true W30 is tough enough, but this car also has the numbers matching 455 Block and Close Ratio 4 Speed. The restoration on this car has been done since the '90s, but you wouldn't know it from looking at it. The body is straight down the sides and across the top. Both doors have excellent gaps with a great fit, with the hood and trunk also having excellent gaps as well. This 442 is done in its factory color combo. The Matador Red is accented by the Black Stripes, it has all been buffed and polished to a mirror finish that's slick as a ribbon. As you can see this W30 has the correct hood with the Hood pins. At the time of the resto new emblems and a new grill were installed. All the Chrome and Stainless is in excellent condition with some light aging to the marker lights and hood trim. The glass is in great condition and all appears original with exception of the windshield which has been replaced. To finish off the exterior it's sitting on a set of 14” Rallyes with Firestone Wide Oval Tires. On the inside, it's also done in the factory combination with Black Interior and Front Buckets. The seat covers are in excellent condition and all the padding is very good. Looking at the console it's done in black with the wood grain accent and houses the Four Speed Hurst Shifter. As you look at the dash you'll notice it also has the wood grain accents that are like new along with the dash pad. You'll be impressed to know that all the gauges are working including the clock in the tic toc tach. Even the original radio is working in this W30. All the door panels are in great condition along with the headliner and sail panels which also have a great fit. In the trunk, you'll see it has the trunk mat, spare, and jack. This is what you've been waiting for, under the hood it's sports the Matching Number 455 Block that's mated to the Matching Numbers Muncie Four Speed. The Rear end is the 12 Bolt Posi with the correct Aluminum Rear End Cover. The 455 is set up with the correct 406115 Winters Intake and a 7040256 Quadrajet Carb with the stock style breather that seals to the W30 Hood. The F Heads are casted as 404 438 which are also correct and have the painted valve covers. For exhaust, it has the 402294 RH and 42295 LH manifolds that flow through dual exhaust with the Trumpet Tips out back. This W30 does have Power Steering as well as Disc Brakes on the front and drums on the rear. When you look under it you'll see the upper and lower control arms have had the bushings changed along with the end link bushings and ball joints. All the floor pans appear rock solid with the rear passenger pan being patched. All the frame also looks great and all the bushings appear to be in good condition.